Three years ago Microsoft Excel turned 30. Some people would say thirties are the best time of life. Microsoft Excel has never been better for sure, and every version has new and even more useful features. 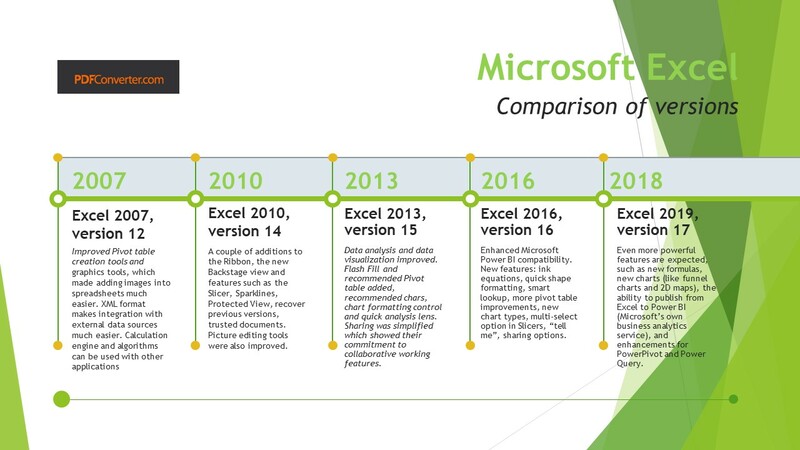 Below in this article you can see the timeline of Excel versions and features’ comparisons. Many different businesses rely on Microsoft Excel every day and like it or not, it has changed the world. Let’s see how Excel influenced different business industries and individuals! Spreadsheets are widely used in the finance field. Ever since spreadsheets came to exist, huge firms saw the potential and benefit in using spreadsheets for managing finance data. Thanks to Microsoft Excel, many companies saved hours and days on managing huge amounts of finance data. Because of different Excel formulas, much of the work was automatized and finance professionals didn’t need to lose time on calculating everything manually. Unfortunately, some companies saw the dark side of it, as their employees abused Excel trying to cover up their financial losses. There were also examples where employees made miscalculations and firms lost billions because of human errors. Accounting and bookkeeping are also the part of finance industry but these two deserve to be mentioned separately. Nowadays every accountant and bookkeeper is required to have advanced knowledge of Microsoft Excel. Creating databases with advanced Excel functions and pivot tables makes the job easier. 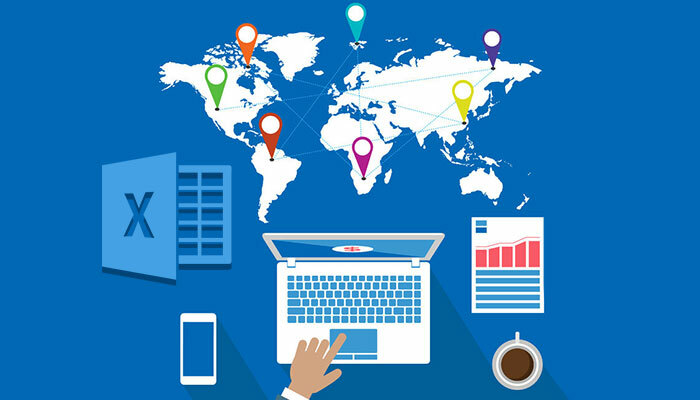 Accountants and bookkeepers can interpret massive amounts of data with ease, to forecast companies’ growth, to do qualitative analysis and so on. Thanks to Excel spreadsheets, HR professionals can have a better picture of the employees, their performances, expenses. They rely on Excel and its ability to organize data for you. Human resources have never been that organized and neat without Excel. Marketers and other professionals use Excel to view and track products’ stats and analysis, to understand market, to make visualized content and pitches for the clients and investors. The usage of Excel in these businesses has definitely influenced the paperless trend as well. No need to write and erase numbers on paper, to calculate your possible losses or revenues, with Excel formulas everything changes automatically. Thanks to Excel, new job occupations have emerged that deal with data, such as data science and data analysis. Data science and data analysis couldn’t exist without Excel. People who like to work with Excel have started new careers as data analysts and data scientists, even without attending college. Individuals learn to track their own expenses with Excel. Every household can smarter manage their finances and expenses. On the other hand, people learn Excel and do freelance jobs for other people, helping them with data entry, personal finance and other data manipulations. The existence of Microsoft Excel challenged tech companies to make competitive tools that deal with spreadsheets, conversion tools that create Excel from PDF or other formats, mobile apps that work with Excel files, and many other tech products that emerged from spreadsheet technology. Since its early beginnings Excel had something to offer to every version that would come up. In 1985 Microsoft released the first version of Excel for Mac, and in 1987 the first Windows version was released. Later in 1990, Excel 3 added toolbars, 3d charts, add-in support and drawing features. Excel 4 was the first popular version of Excel released in 1992, which had more customizable toolbars, more shortcuts and mouse implementation. A major upgrade of version 5 introduced support for VBA, multi-sheet workbooks and macros recording. 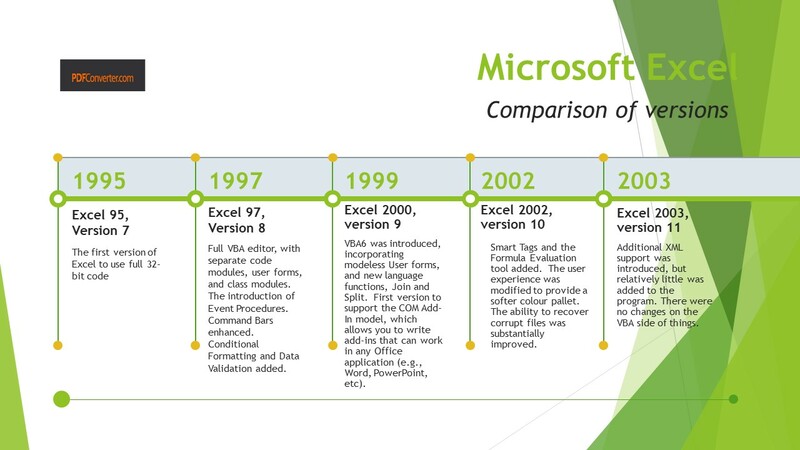 Starting from 1995 until present day, you can check the timelines above and compare Excel versions. The latest version of Excel has just been released and we will see how it will change the business world in the years to come. Excel is here to stay, and businesses will keep using Excel as a first-choice tool for managing projects to company’s team building events. An advanced knowledge of Excel is crucial for most business professionals today, and strong Excel skills can create an opportunity for further career development. Excel is a powerful tool and everyone should take advantage of it, to give the best results to their business.